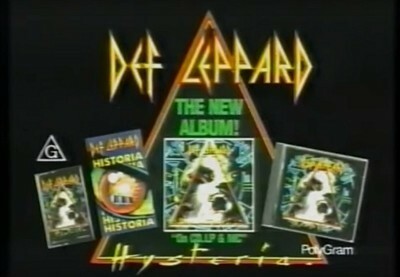 A rare 1989 TV advert for Def Leppard's classic Hysteria album has been posted online. The advert dates from early 1989 in Australia when 'Rocket' was the current single. 'Pour Some Sugar On Me' had yet to be released as a single in the country but became a hit later that year. After this the album reached Number One there for the first time in August 1989 exactly two years after its worldwide release. Watch the full ad below as posted on YouTube.